with H.H. the XIV Dalai Lama (center). His Holiness Drikung Kyabgon Chetsang, the 37th throne holder of the Drikung Kagyu Lineage and 7th reincarnation of the Chetsang Rinpoche is a manifestation of Chenrezig (Avalokiteshvara). His Holiness Drikung Kyabgon Chetsang, Konchog Tenzin Kunsang Thrinle Lhundrup, was born on the 4th day of the 6th Tibetan month of the Fire-Dog-Year 1946 into the aristocratic family of Tsarong in Lhasa. 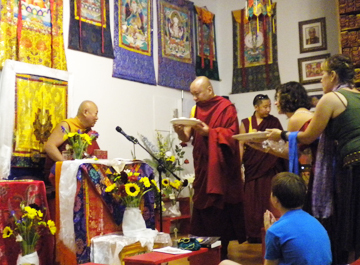 This auspicious day marks the anniversary of the Buddha’s first turning of the Wheel of Dharma. Many prodigious signs and visions accompanied his birth. His grandfather, Dasang Damdul Tsarong (1888-1959), has been the favorite of the 13th Dalai Lama (1876-1933), Commander General of the Tibetan army and one of the most influential political figures in the early 20th century in Tibet. Chetsangs father, Dundul Namgyal Tsarong (b. 1920), held a high office in the Tibetan Government and he was still active in important positions for the Exile Government in Dharamsala after the escape of the Dalai Lama and the cabinet ministers. His mother, Yangchen Dolkar, is from the noble house of Ragashar, which descended from the ancient royal dynasty. He began his philosophical studies at the Nyima Changra monastic college of Drikung. Although he was four years younger he studied together with the second Drikung lineage holder, the Drikung Kyabgon Chungtsang. 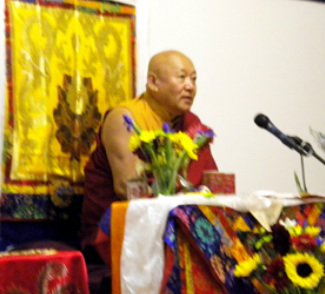 His instructor was Bopa Tulku Dongag Tenpa (1907-1959), introducing him to the philosophy of Madhyamaka. He first studied basic texts, like The 37 Practices of a Bodhisattva by Ngulchu Thogme Zangpo and Introduction to the Bodhisattva's Way of Life (Bodhichary?vat?ra) by Sh?ntideva. Soon thereafter Tibet underwent a great upheaval. In the wake of the Tibetan uprising of 1959, as many Tibetans fled the country, among them the Dalai Lama, the cabinet ministers and a host of spiritual dignitaries, several attempts were launched to bring the Drikung Kaybgon Chetsang and the Drikung Kyabgon Chungtsang out of Tibet into safety. These attempts failed because of the inexorable resistance of the monastery manager. His Holiness Drikung Kaybgon Chetsang's family had already fled to India in 1956. His Holiness Drikung Kyabgon Chungtsang, the 36th throne holder of the Drikung Kagyu Lineage and the 8th reincarnation of the Chungtsang Rinpoche is a manifestation of Manjushri. Drikung Kyabgon Chungtsang, Tenzin Chokyi Nangwa, was born in the Water-Horse-Year 1942 in Lhokha as the youngest of five sons into the prominent aristocratic Lhagyari family. His father was Trichen Kelsang Nyendrak and his mother Rigzin Chodzom. The Lhagyari family is one of the oldest noble houses of Tibet descending from the ancient royal dynasty. The family branch is called Dewa Lhagyari Trichen.